Before you leave on vacation check the VI website ‘Know Before You Go’ page for the most up-to-date information specific to this resort. This includes all the information you need to make your vacation memorable after your reservation was confirmed and before your travel date. • Occupancy limits apply to all ages, including infants. A fee will be assessed for non-compliance. • Units are randomly assigned by computer on the morning of your arrival. No specific request can be taken. • Mid-stay cleans only occur for stays of nine nights or more. Additional maid service will be charged at current rates. unit during your stay and has a height restriction of 7 feet. Larger vehicles are not permitted on property. • Smoking is not allowed in rooms, decks, lanais or patios. A fee will be assessed for non-compliance. • Pets are not allowed at VI Resorts. A fee will be assessed for non-compliance. • An “Accommodations/Lodging” tax, required by state and local regulations, will be collected upon arrival. The nightly tax rate is based on condominium size and season. You can preview the taxes and other reservation costs online, by clicking on the ‘Cost Calculator’ on the availability page. bedroom size and unit occupancy. Online check-in: Log in to www.viresorts.com and click on “Check My Reservations”. Check-in Location: The check-in office is in the lobby of the resort. Front Desk Hours: 8:00 a.m. - 6:00 p.m. daily. Longer seasonal hours may apply. After Hours Check-in: Please call the resort in advance for your room assignment and instructions. Deposit: A $50.00 credit card authorization is required at check-in for all Owners and Guests, or $150.00 in cash. Queen bed, 1 full bath, no kitchen*. King or Queen bed, ¾ bath (shower only), balcony, seasonal gas fireplace, no kitchen*. Queen bed, 1 full bath, balcony, seasonal gas fireplace, no kitchen*. Queen bed, 1 full bath, seasonal gas fireplace, no kitchen*. King bed, Queen sleeper sofa, ¾ bath with a walk-in shower, kitchen* with 2 burner stove, balcony, seasonal gas fireplace. King bed, Queen sleeper sofa, 1 full bath, kitchen* with 2 burner stove, seasonal gas fireplace. All units are equipped with a Keurig individual coffee maker, microwave, under counter fridge, TV/DVD, hair dryer, iron and ironing board and seasonal air conditioning. Studios: Due to their size, the studios do not have a kitchen. A complimentary breakfast is offered 7 days a week, in the lobby, from 8:00 a.m. to 10:00 a.m.
Blackbird Lodge is located in the Bavarian Village of Leavenworth, WA in the Cascade Mountains approximately 130 miles northeast of Seattle, WA. • North of Everett, take US 2 East through Monroe, Sultan and over Stevens Pass to Leavenworth. • In Leavenworth: From Hwy 2 turn south on 9th St. (traffic signal). 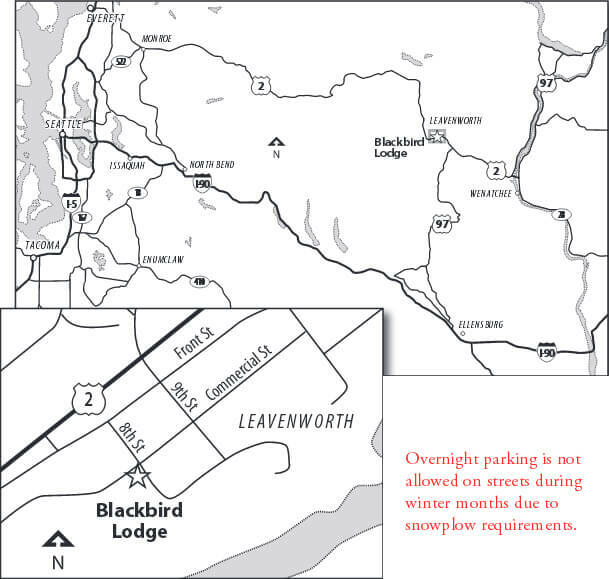 • Turn right on Commercial Street Blackbird Lodge is at the corner of 8th St. and Commercial St.
• Take exit 85 to Hwy 970, which joins Hwy 97. • Drive north on Hwy 97 to Hwy 2 and turn west toward Leavenworth.